As you see, you have so many of these medications which have come over last 30 to 40 years, it is only now in last couple of decades that we have been using them more effectively because we have learned how to use the combinations. What is important is, treated yet uncontrolled hypertensives actually carry a sizeable risk and these are the ones who actually need to be addressed with combination therapy. When we talk of why the blood pressure control is suboptimal, we have many reasons and one of them is actually noncompliance with the therapy. We also contribute by poor physician-patient communication, like we perhaps fail to emphasize on their mind as to why blood pressure has to be controlled, two, he may need more than one medications and thirdly there is what can be called as, clinical inertia. This actually says that only 13% of the patients who actually visit doctors who are not at goal get an upgrade to a higher level of medications. That means we know that the patient is not controlled, yet, we sort of believe that CT all kind of therapy and the patient is not up to mark as we go on. The good news is if we combine the two medications from different groups, like this column is where you double the dose of any medications like thiazide in this particular group, while here thiazide is combined with something else, this improvement in blood pressure control is almost 5 times than what you get by doubling, so it makes sense that don’t traditionally jump the dose, but add something more so that your blood pressure control is very effective, and we know from ASCOT that if we add combinations the new onset diabetes is improved, the new-onset renal impairment is also improved, so combinations are perhaps the way we would want to go. Why we combine? Because there is a kind of synergy between the two different medications that we choose, it has lesser side effects, this is something very important, like for example, if you have somebody with bradycardia with beta blocker, instead of jumping beta blockers we could add something more so that we avoid the similar side effects and there is an enhanced compliance primarily because the side effects are less with a combination and we can increase the duration of action and there is a potential of additive cardioprotective effects when we combine these medications. Again, for stroke, you can see single monotherapy, combination therapy is clearly superior. So, you have to learn to choose the correct medications. All these studies which have compounded the impact of hypertension on benefit to the patient they have shown that we have to always combine more than one medication from different group to get to the targets. Most of the studies where you hit the target, they actually use more than two medications, and this is how in fact in VA study all 100% patients had actually more than two medications. All these guidelines they appreciate that we need to go beyond the conventional guidelines setting and we need to combine these medications, so if you have to use 2 or 3 drugs in combination necessary to achieve the target, same thing written here; however, one goes further and says that when the blood pressure targeted to be achieved is more than 20 systolic and 10 diastolic, consider initiating the therapy with two drugs, that means, just starting a single dose is not enough, but use two tablets straight away if you want to achieve the target. Same comes for ESC, that if you are high risk individual and you want to come down on blood pressure, again high risk means you have some end-organ damage, diabetes, renal function, cardiovascular disease, again you are certainly allowed to use two drugs as first choice, that means first prescription itself can take two medications as a therapy. This is from UKPDS where actually a comparison is done between the conventional control versus the tight control and everytime we move to a tighter control, you feel that the medications required could be more than one, so tighter target going to be more than one medications and where you need the tighter targets, we have problems with diabetes, we have problems with renal disease. This is actually various studies in which lowering blood pressure in diabetics, the mean systolic blood pressure in the intense group, which is what gave the benefit, had targets which were around 140 so diabetics is one where we would definitely look to lower target. What about chronic kidney disease? Again, in chronic kidney disease, if you want to have a preserved GFR your mean blood pressure should be lower, so if you have untreated patients like here your GFR is going to go down slowly over a length of many years, so you must have a lower mean blood pressure. This is actually a slide which shows those who had proteinuria more than 300 and those who have proteinuria less than 300, here it does not make a difference whether you are controlling them very tight or an average control, but those who have more than 300 proteinuria, the tighter control clearly gave the benefit. So, we are going to be dealing with subsets where you and I feel that the blood pressure control has to be very strong. The last one is of course the elderly hypertensives where systolic blood pressure targets could be very different. You have lots of studies listed here in which again the goal blood pressures were something like less than 150 and the mean achievable blood pressures were something like 143, 141, 144, so they were clearly achieving a better target and this is only because combinations were achieved. These are the subsets where you probably want tighter blood pressure control and obviously there would be a need to use more than one medication. Now, there is always this debate whether the achieved blood pressure is important or the class of medications that you use to achieve the blood pressure is going to be important so we generally like to sort of spread our antihypertensive to these standard 6 subgroups. However, as we move on we realize that in ASCOT we have perindopril and amlodipine, which gave such a huge benefit including new-onset diabetes less by 30% and that is why we keep talking about some preferred combinations, some acceptable, and some are less effective kind of combination. If you go back to this diagram you realize that those who are dotted lines are probably not the preferred combinations, so beta-blockers, ARBs are probably not such a preferred combination. However, when we talk of compelling indications you need to move away from this concept. Like if you have a subset where you have post myocardial infarction, beta-blockers, ACE inhibitors are going to be together in almost every case that you and I want to treat. There is a standard where we say that these are good together, these are okay to go to be together, and these we will not use together, but this holds true only if you are dealing with hypertension alone, moment you go for some compelling indications, you may have to keep this combination aside. What about three drug combinations? The European Guidelines 2009 say that if you want to use three, the ACE inhibitors, the calcium antagonist, and the diuretics are the three which we would like to use together. This is a standard thinking, the British Hypertensive Society suggest that if you have age less than 55 year, age more than 55 and this is the way to go so you have ACE, ARBs, calcium blockers and diuretics and beta-blockers are not recommended as first line in any hypertensive protocol. I think Europeans probably moved away from beta-blockers much earlier or ahead of the Americans and today when we use the same diagram, you realize that from this the half is gone and you only have diuretics, ARBs, calcium blockers, and ACE inhibitors. The beta-blocker components which is this side and alpha-blockers are removed, so you have only 4 actually playing most of the role in the management of hypertension today. When we talk of different combinations like in this ACE, beta-blockers then something like ACE calcium blockers and you look at the various mortalities, some striking features emerge and here is, lets say stroke, and here we see calcium blockers are better and ACE inhibitors are actually not going to be good, so if you have stroke as a primary event for a hypertensive individual earlier, you are probably strongly going to use calcium blockers. What about heart failure? Again, calcium blockers, a big no if there is a heart failure while ACE inhibitors strong yes if there is a heart failure. You have to think where you want to take your patient, what he has associated as comorbidities. Overall, ACE inhibitors and the CCBs exhibit vascular protective effect so this combination is generally considered to be very effective. What do you expect by way of JNC 8? When we talk of this, you know, we are all accustomed to step care approach in the earlier years and today also beta-blockers, diuretics do play a role; however, we may expect that two drug combinations may be the first step and these two drug combinations could be one of the three, the ACE, ARBs, thiazides or the amlodipine, and then if you are not at target, instead of two you would add one more from the first three that we talked about and so on, so this is how we probably expect the changes to take place. The calcium channel blockers and ARBs are generally considered a very strong combination. They have lots of benefit. We know that the calcium blockers they have arterial dilatation, but not so much of venodilatation, so the fluid leaks out and you have peripheral edema as one of the strong downside of the calcium blockers. Amlodipine, we all understand is one of the strongest blood pressure lowering agent. In fact, if you have somebody with a pressure of 180/120 presenting to you for the first time, the prescription must necessarily include amlodipine as your first drug; however, peripheral edema is the strong effect and if you add ARB to this, there is simultaneous venodilatation and this perhaps would take away. The worse are probably the beta-blockers and the thiazides and the other calcium channel blockers would come somewhere in between. Why the combination of calcium blockers and ARBs is generally very important? This actually offsets this kind of disparity between the benefit and the downsides of calcium blockers. Like calcium blockers, there is no renal effect or no benefit on CHF and there is RAAS activation. Once you add the ARBs, this gets negated to a great extent, then you will have a RAAS blockade coming with ARBs and CHF component also improved by ARBs. We know that calcium blockers have purely arterial dilatation while ARBs will give you the associated venodilatation and thus attenuates the peripheral edema and ARBs are effective in the high renal renin group while the calcium blockers are effective in the low renin group and thus they are sort of helping each other to come together, potentiate their action and also avoid the downsides. In ACCOMPLISH, we had this combination of amlodipine and benazepril, but what is striking about ACCOMPLISH, I mean, you can use this combination many times, but the drop that you got in blood pressure was exceptionally high and exceptionally early, so an exceptional drop with initial combination therapy with ACE and calcium blockers. If you have somebody with moderate blood pressure probably this is going to be your best combination to get to the target. STITCH, another interesting study, what STITCH did is compared the conventional Canadian Guideline based kind of approach versus a fairly simple approach of a fixed-dose combination pill started at half tablet, increased to 1 tablet and so on and this actually achieved a higher percentage of blood pressure control compared to the conventional method, so fixed dose therapy is again a very important issue, a fixed dose combination might be the preferred initial treatment over single agent. We are not only talking of using true medications together in our first prescription, but actually using a fixed dose combination as first prescription and doubling it up if required during a followup. The initial therapy thus is getting modified from 1 tablet to 2 being given together and there would be obviously reasons why we would want to do. If the blood pressure patients need stronger drop 20/10, all these studies sort of support if your blood pressure systolic is more than 160, all these studies are sort of suggesting that you should start with combination therapy straightway and not sort of start one today, so the step one management for hypertension which is going to be slightly more than mild is probably going to be a combination therapy. This fixed dose combinations you can see so many of them written on the wall, they actually improve the compliance. You see, beyond one year once you start the therapy the compliance of any hypertensive drops acutely and people in year 5 or year 10 tend to use lesser and lesser medication mostly on their own, we all face this in our clinical practice and if your compliance goes down, your event rate keeps climbing up. This is what the slide says, so you must understand that you write a prescription that the patient is going to like or what the patient is going to want, it could be a fewer tablet, it could be cost saving or whatever but the prescription the patient should like and this is what if your patient is compliant, if you use a single tablet, the noncompliance goes down by almost 24%. So, use combination therapy so that the compliance is improved and the patient really really gets a benefit. This compliance issue is not just with hypertension but it is with all chronic diseases like rheumatoid etc., so always think of cutting down the number of tablets for a given patient and this is what you can achieve, fixed dose combination therapy, you can achieve a better compliance compared to co-administration of two pills, so one pill is clearly better than 2 pills. Fixed dose combination thus can be used to reduce the pill burden, to simplify the regime and to improve the compliance of the patient. Finally, we are all used to JNC 7 Guidelines trying to use thiazide like diuretic as the first line therapy. What we should expect with JNC 8 is either a thiazide type of diuretic, calcium blocker, ACE or ARB inhibitors, will be recommended as initial therapy and direct renin inhibitors will be recommended as an additive, but not first line. Now this is going to be again combinations even to begin with, so I think the combination therapies will play a very important role to improve the compliance of the patient and thus get the benefit to outpatient. Dr. Amaresan: I think I agree with you on the general principles, but then, even if there is a 30-300 mg of proteinuria, it is important that you reduce the blood pressure below 130/80 because kidney is a window to the vascular tree and the microalbuminuria itself shows there is a diffuse endothelial dysfunction and in diabetics it is better to keep it lower because lower is better because diabetic tissue either it is a myocardium or the kidney is very susceptible for small rays of pressure. Dr. M S Hiremath: There are two clear areas, one is diabetes and one is CKD and especially CKD with a higher proteinuria. These will be indications to change the target and get to a lower target and also to a great extent the isolated systolic hypertension. Dr. Amaresan: Instead of saying that ACE or ARB when you combine with a diuretic, it not only potentiate the reduction in the blood pressure and also reduces the pill burden, it also potentiates the reduction in the proteinuria and also reduces the volume overload. In the same way, when you talk about ACE or ARB instead of saying ACE or ARB, I would like you to say that it is ramipril or perindopril because there is a lot of evidence based medicine to support this combination, for example perindopril combined with indapamide has reduced the incidents of stroke, so it is very important, not only that ramipril and perindopril are not only longacting but also it acts at the tissue level when compared to the other ACE, that is why you find more popular prescription with ramipril or perindopril. In the same way, if you say ARB, telmisartan, irbesartan and olmesartan has a lot of evidence based medicine, because they are not only longacting, you can even skip one day because they act for 48 hours and they are also PPAR gamma agonist, particularly telmisartan and irbesartan. Dr. M S Hiremath: I mean if you are to differentiate the ACE inhibitors from ARBs, we all feel that the ARBs are clearly more important, more potent to achieve the blood pressure drop. Cardiovascular protection probably would come fairly strongly with drugs like ramipril, but if you want the digits to come down, I feel the ARBs are clearly more potent. Question from Audience: In chronic kidney disease stage III and beyond, you cannot use the ACE inhibitor or ARB with a fear of decreasing GFR and hyperkalemia so we are using more than 3 and 4 antihypertensives; beta-blocker, calcium channel blocker, alpha blocker, or centrally acting drug like Arkamin or Moxivas and if not controlled the other drugs we also are using. So, how you can use this centrally acting drugs in these patients because they are not mentioned in combination. We are not using the combination of the drugs where dose is very high, we are using the high dose of the calcium channel blocker. Dr. M S Hiremath: Actually, if you see the nephrologist's prescription, I think they use 4, 5, 6 antihypertensive. They do exist and they exceed the upper limits of all the dosages making one wonder whether we should be using those kind of dosage, but my own belief is that they are forced to, the blood pressure is never at the target despite using 3 or 4 antihypertensives, so up to a level where creatinine is not going up, ARBs could be renoprotective, I think we have strong evidence for that so my renal dysfunction, which you are going to monitor with repeated values of creatinine and potassium, I think you could certainly use ARBs as renoprotective in addition to all the other antihypertensive that you are going to use. Question from Audience: Dr. Hiremath, more than a decade ago there was an evidence that perindopril if used in a patient who had developed stroke it prevents to certain extent further stroke, now here you said something you know that it is not used as first line antihypertensive for stroke patients. Dr. M S Hiremath: If you see, the stroke would go primarily more with calcium channel blockers, you could use drug like perindopril in addition to calcium channel blockers. I was actually trying to highlight under what subset which is going to be a preferred drug, so for CHF like no channel blockers, ACE or ARBs would come ahead, similarly for stroke, calcium channel blockers would be ahead and ARBs would probably be later. Dr. Satyavan Sharma: Just a very brief comment, in diabetics the recent ADA recommendation tells that even in diabetics the blood pressure lowering should be 130/80 not to go 120/80, not go too low. Dr. Santanu Guha: I was going to ask regarding the same issue because this was raised that in diabetes and in patients with proteinuria, lower it as much as possible, but perhaps evidences are not so. ACCORD trial and another trial have convincingly shown that too much lowering of blood pressure did not add anything for the cardiovascular mortality, Dr. Venkata Ram is here, I just want to have his comments. Dr. M S Hiremath: Blood pressure lowering, ACCORD still showed benefit on stroke, but none of the other areas. Dr. Siddarth Shah: I think I will intervene in between. We have come out with guidelines on hypertension, you must be knowing about it and the latest ADA recommendations that have come in January, if you all have seen, it says that 140/80 is the blood pressure that is at target and not 130/80 also so this we have included in our guidelines also, our guidelines have come out in January and this definitely gives a guideline of controlling blood pressure in diabetic hypertensives. 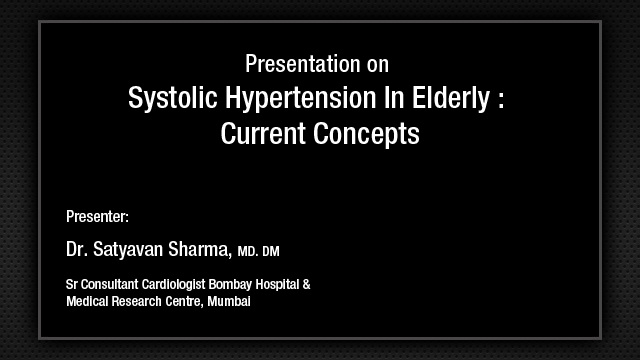 Dr. Venkata Ram: Dr. Hiremath has covered the topic so beautifully. It is correct in the PROGRESS trial, perindopril in combination with indapamide had stroke protective effect, but the evidence is more for CCBs, but this was a trial with perindopril and indapamide. 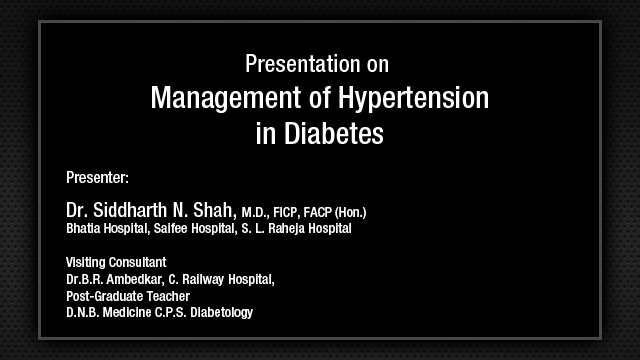 Now the goal blood pressure for diabetic hypertensives will be part of the highlights of JNC 8. The lower blood pressure as you mentioned did not provide incremental benefit that is all, but there was a tendency towards reduction in stroke. One has to be very very careful that one should not interpret this as being dangerous because that is where fallacy could be. We should not lose good blood pressure control in diabetics if somebody interprets that lower blood pressure was dangerous. It was not dangerous, but it did not provide the benefit that you expected so I think the JNC 8 guidelines will still suggest good aggressive blood pressure control in diabetic hypertensives but may not be that additive benefits so I think we will have to be very careful that we do not lose good blood pressure control in diabetics and should not misinterpret ACCORD. Dr. M S Hiremath: The J-curve holds true or it doesn't hold true? Dr. Venkata Ram: The J-curve, it is for acute coronary syndromes, for acute treatment of hypertension J-curve is there, but I think so many studies have shown that there is really no J-curve for doing chronic management of hypertension. The J-curve that Dr. Satyavan Sharma has shown in people with diastolic less than 80 or 70 that is probably due to underlying cardiovascular disease, not so much due to blood pressure, those are the patients who are not able to generate blood pressure, so real J-curve during long-term treatment of hypertension does not appear to occur. Dr. M S Hiremath: May I ask you why JNC 8 is taking so much time to come out? Dr. Venkata Ram: Actually one of those things is multiple guidelines are going to come out the same time, lipids, obesity and all these things and each time some of the new trials have come that they have to prolong it, ONTARGET came they prolonged it and recently the reanalysis of ACCOMPLISH trial 2 months ago again prolonged it a little bit because in one subsection of the ACCOMPLISH trial, a new revelation that the best prognosis in the ACCOMPLISH trial was in people who are obese, so all of a sudden now there is a good section on non-pharmacological treatment and suddenly we are saying, so these are some of the issues. I do not think it was by any design or it was not managed properly. Dr. M S Hiremath: This is also true that if you see post bypass patient, obesity as a risk factor, those who were more than 65 years it did not matter, only for those who are less than 65 it made a big difference in terms of morbidity as well as mortality, so obesity at an older age is probably not too bad. Question from Audience: Could you enlighten people when would you use an MRA, i.e., spironolactone or eplerenone in hypertension as an antihypertensive. Dr. M S Hiremath: As we go down, certainly not in the beginning. I mean we would go with chlorthalidone, ACE, ARB or calcium blocker. I will probably use two of these at the beginning, add the third one and if you are still not at the target, I will go to spironolactone, but there is a difference between spironolactone and eplerenone also and there is study which suggest that eplerenone use is probably superior to spironolactone in giving you the drop in the blood pressure, so may be if you are still not at target spironolactone will also go away and you will move to eplerenone. Question from Audience: My question to Dr. Shah please. Sir, you have just recently released the Indian Guidelines of Hypertension, do you think that it is going to contain some of the likely outcome of the JNC 8. Dr. Siddharth Shah: Well you have put a very valid point. 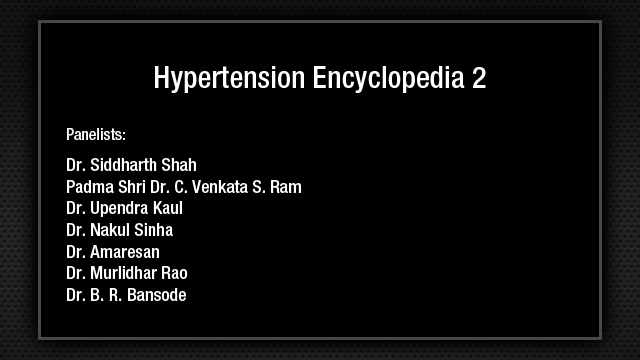 Those who are members of API must have already received our Indian Guidelines on Hypertension. We were waiting for last 1-1/2 years also looking towards the JNC 8 when it is coming, but JNC 8 has been delayed so long that our guidelines have been ready for almost last 1 year and so we deliberated and we have taken up the cues what is going to be the future of the guidelines for Indian population, so we did come out with this guidelines in January and we hope that in June JNC 8 will come. We might bring out the abridged version after that also, but what we feel is that there are certain differences which I will come to tomorrow in my lecture and I will allude to you what are things we are expecting and we have changed in our guidelines. Question from Audience: What I want to ask you sir, you have used a vast methodology for Indian guidelines, which have been released after very long, after 2005, so are you sure that you are going to stick to the same irrespective of the JNC 8. Dr. Siddharth Shah: Yes, our thinking is very very critical and we have gone through every aspect of it, we have seen the latest trials also so I think we will stick to it. We cannot go on changing guidelines every year and what we have done is we have taken Indian hypertension into consideration and that is why I think we will stick to what we are promoting.